After about 10 days of variable weather, another high pressure system finally arrived at this past weekend. With sunshine in the forecast for both Saturday and Sunday, Ben and I had to take full advantage of it. 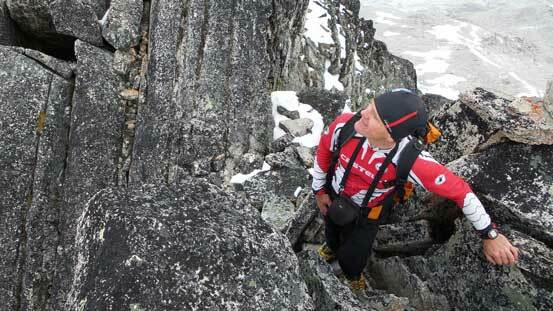 Last time we did two 11,000ers’ snow climbs back-to-back but this time we wanted to do something different. 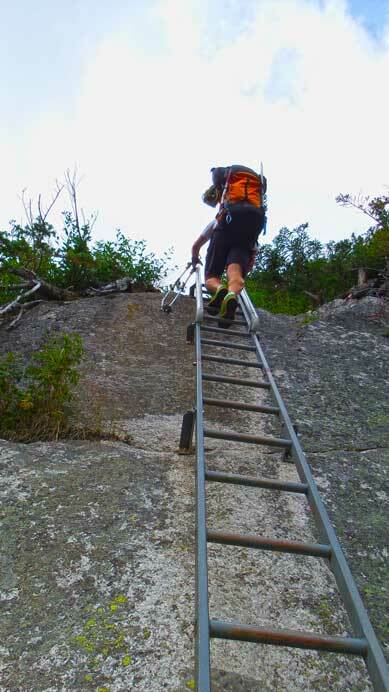 We were keen on some classic rock routes as we hadn’t done many rock climbs this year yet. 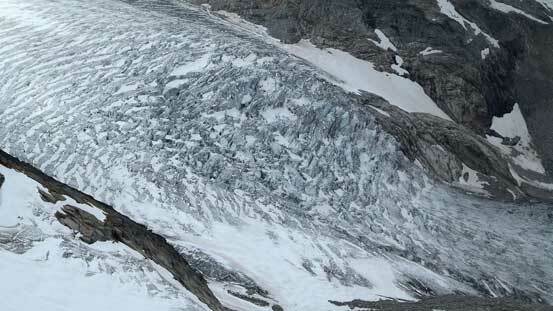 We had the choice between Bugaboos and Rogers Pass and the main reason to pick Bugaboos was because of the deteriorating condition on Bugaboo/Snowpatch col. With the current heat it’ll become impassible soon, so we finalized the objective on the classic West ridge of Pigeon Spire. 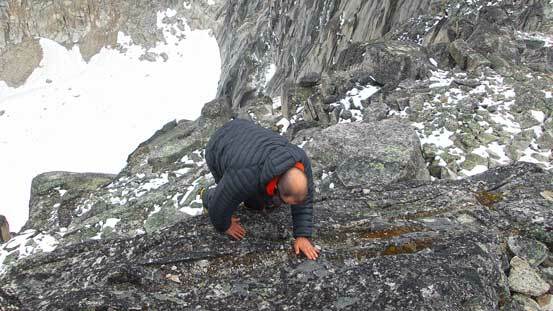 With Ferenc joining the team we increased the ambition to the Kain route on Bugaboo Spire at the last minute. 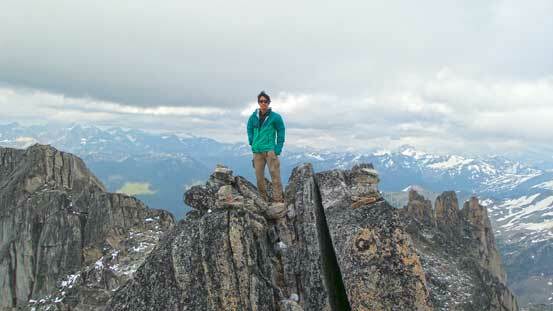 Obviously two days wouldn’t be enough for both Bugaboo Spire and Pigeon Spire so we had to use Friday. That also meant we’d have some chance on bagging a smaller spire or two, even though the weather wasn’t looking great on this day. After car-camping somewhere in Calgary Ben and I picked up Ferenc from his house, and left Calgary by around 7 am. 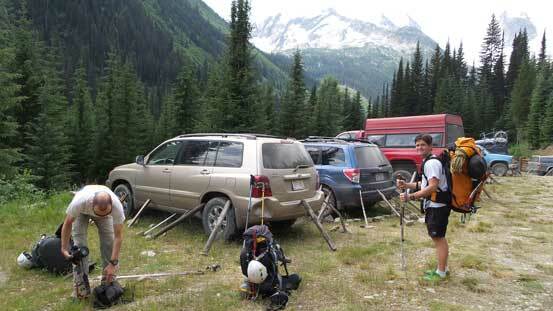 It’s a fairly long drive to the Bugaboos with the last 45 km or so on a logging road, followed by a near 2-hour hike to the base camp at Applebee Dome. This was my second time doing this approach and it still felt steep, especially with a big backpack. (At roughly the same time last year, I scrambled Eastpost Spire with Eric and ever since that trip I always wanted to come back for the more challenging spires). Getting ready at the trail-head. Note the chicken wires. An obligatory shot of this ladder. 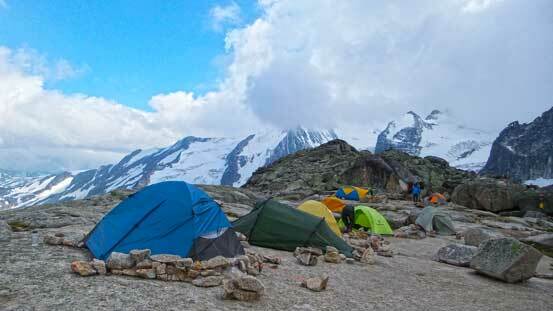 It was cold, cloudy and windy when we arrived at the camp in the afternoon. Needless to say, we were lack of motivation but after hanging around for a while we still decided to give Crescent Spire a shot. At least its summit was low enough to escape from the clouds. 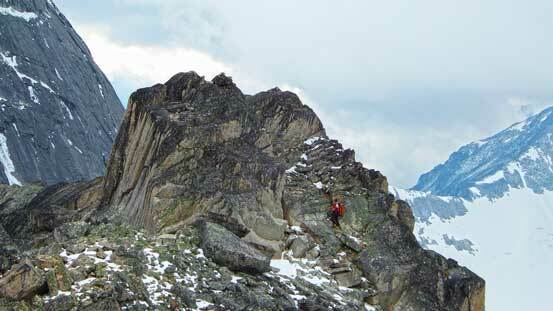 For those of you unfamiliar with the Bugaboos, Crescent Spire is one of the easiest objectives and the scrambler’s route is only class 3 and only for the last bit near the summit. 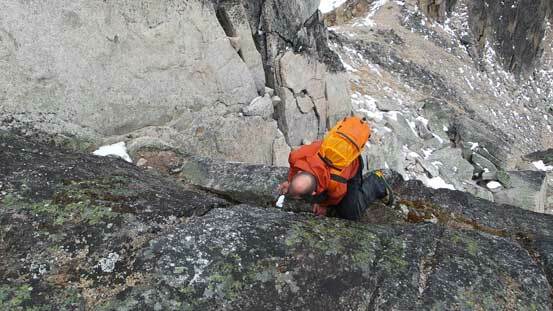 Most of the route is grinding up a loose gully. 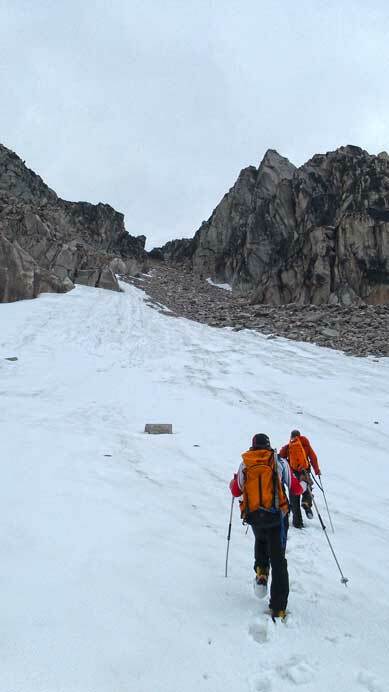 So we picked up a set of tracks (on snow) and made our way up the right hand side of Crescent Glacier, overcoming one interesting rock step. There were also a few beautiful tarns that we passed by. Soon enough we arrived at the base of the loose gully. 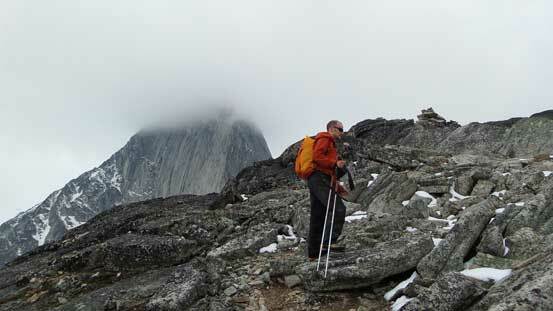 Slogging up, snow soon gave way to rock and the quality was very poor as for Bugaboo’s standard. 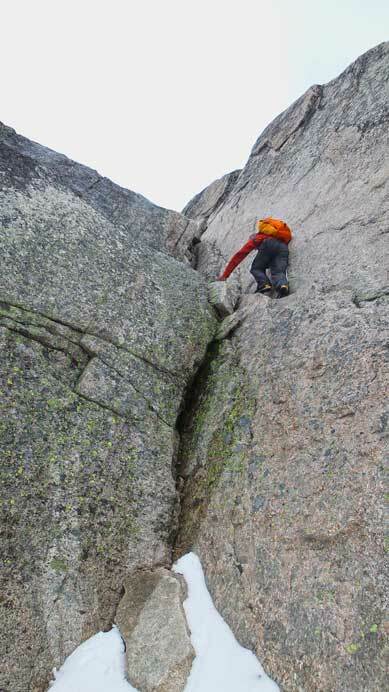 It’s still better than some of the ugliest gullies in the Rockies like the one on Fortress Mountain, but we could easily dislodge microwave sized boulders down to each other. 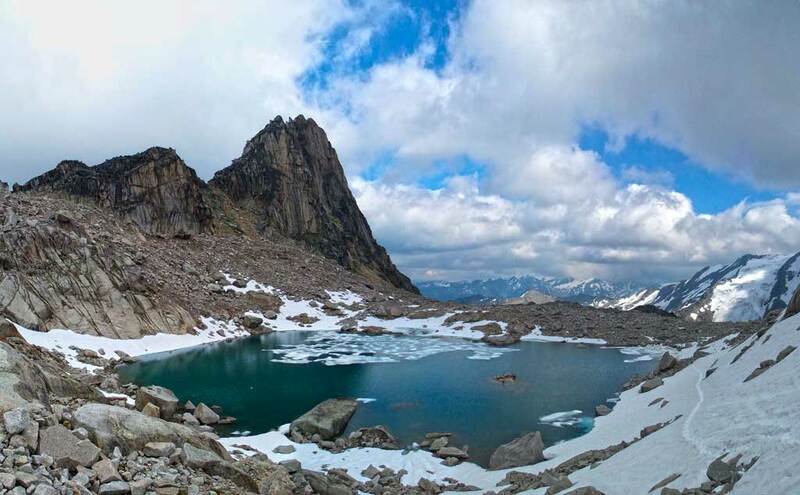 At one point a series of boulders came down towards me and I failed to dodge one of them, and as a result I got a painful hit on my left leg… In any case, we all slogged to Crescent Spire/Towers col.
A beautiful tarn that we passed by, with Eastpost Spire behind. Click to view large size. Now, time to grind up this gully. First on snow, then on loose rock. From the col we turned left trying to stick as close to the south ridge proper as possible. 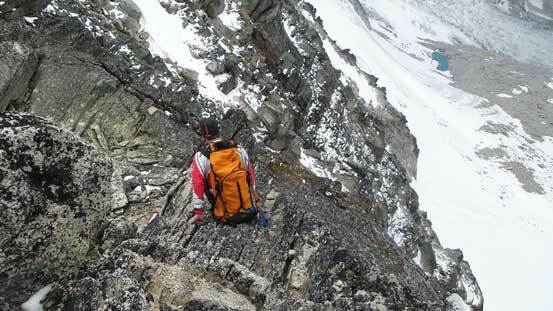 There was one interesting section before the false summit that we felt a bit awkward. I’m not quite sure if it’s only class 3 but we might not pick the easiest line neither. 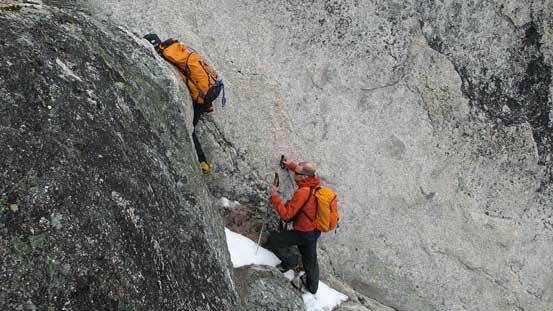 There’s potentially a better line to the right of ridge proper but we couldn’t tell. 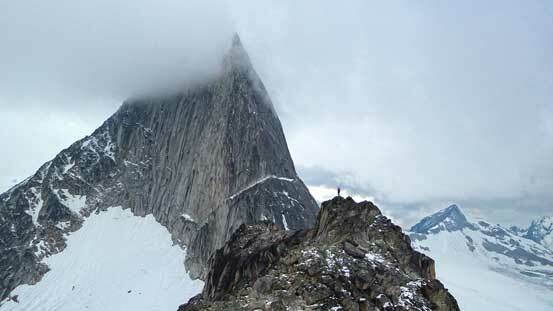 But soon enough, we arrived at the “summit”, only to discover there’s another higher point further down the ridge towards Bugaboo Spire. 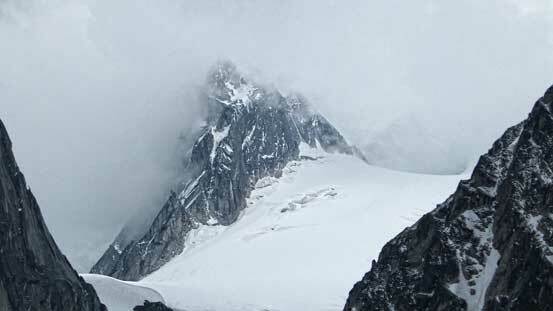 Oh well, we’d have to traverse to the true summit then. 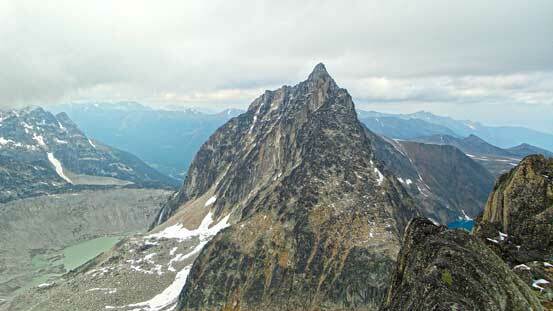 Impressive Snowpatch Spire, hardest spire in the entire Bugaboos.. 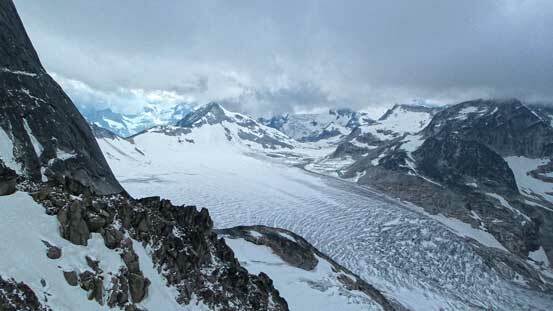 Directly behind us was the south ridge of Brenta Spire, another one I want to do. 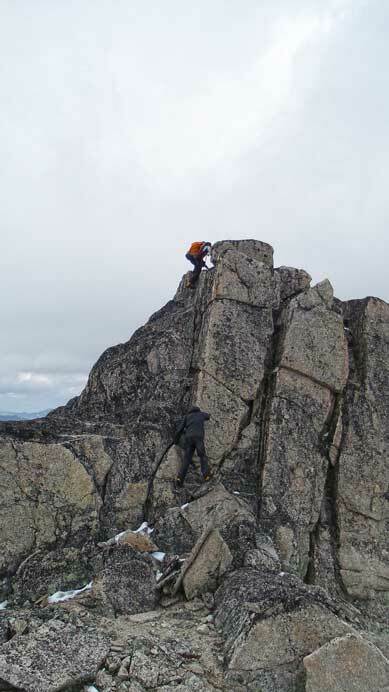 The traverse to the true summit was exposed and fun, with a few interesting but short down-climbs on the way. 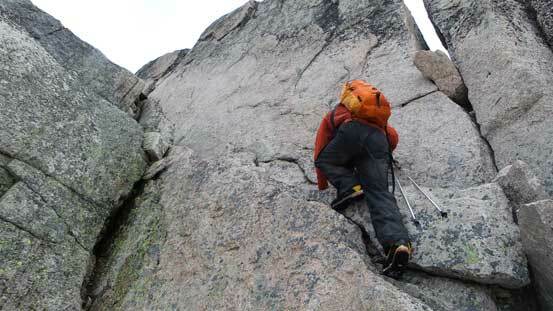 The rocks were super solid and the scrambling provided us a very good warm-up for the rest of this trip. 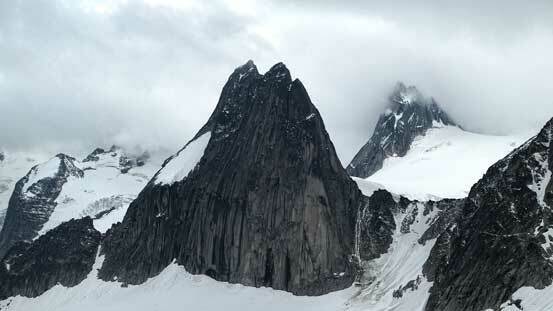 The best view from this summit was towards Bugaboo Spire’s NE Ridge but too bad, the summit of Bugaboo Spire was hidden in the clouds. At least we could tell the weather was slowly improving and the clouds ceiling was slowly lifting. 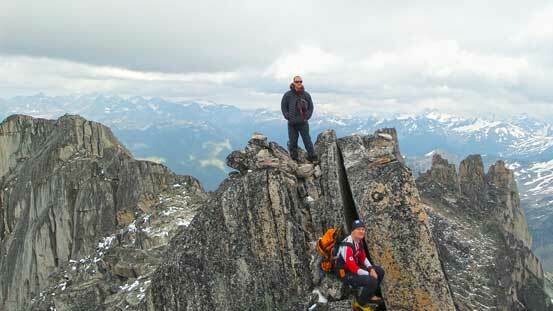 Down-climbing the ridge was fast and fun and we made back to Crescent Spire/Towers col in short time. 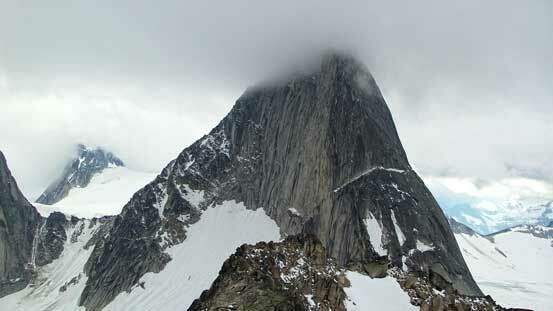 A closer view of Snowpatch Spire. 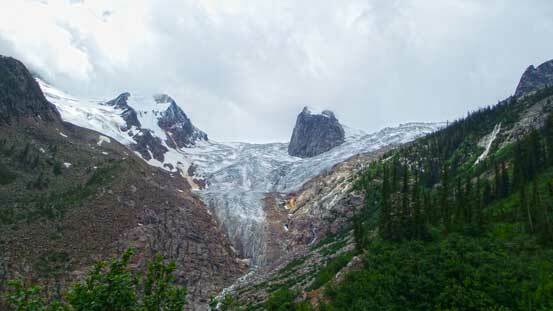 Bugaboo/Snowpatch col just to its right. 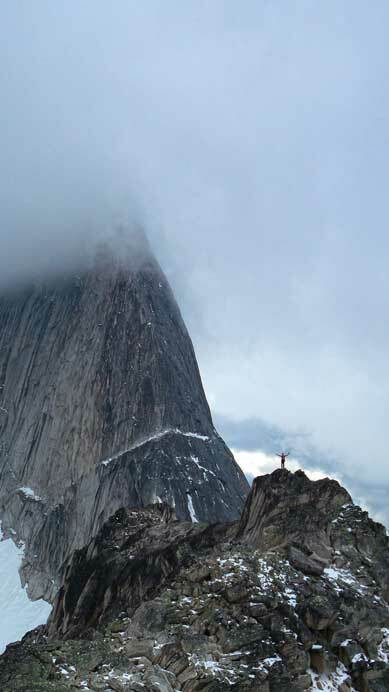 Ferenc admiring the intimidating NE Ridge of Bugaboo Spire! 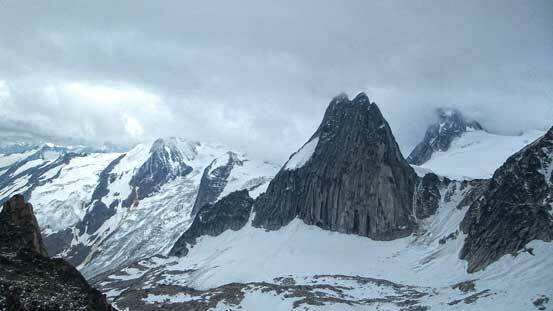 Bugaboo Spire will be our objective on the 2nd day – getting psyched! 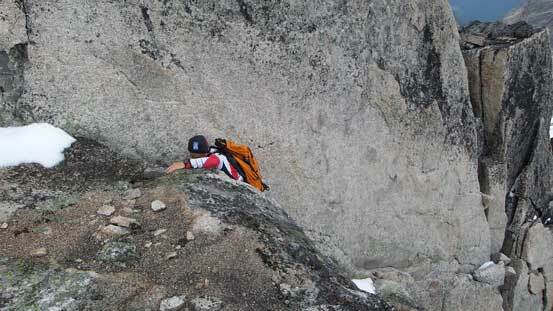 The left skyline ridge..
Ferenc descending another line down this step. 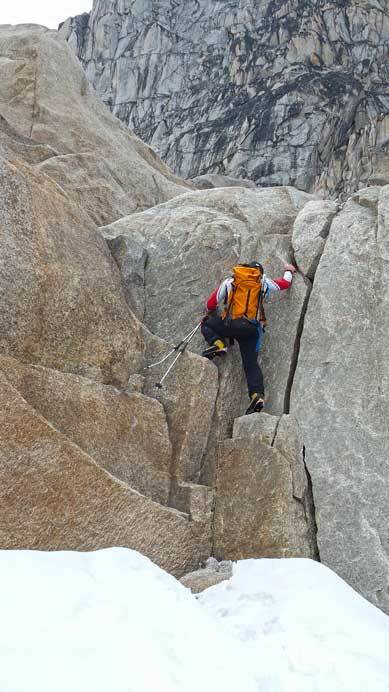 Before this trip Ferenc bought a brand new copy of the Bugaboos climbing guidebook and he didn’t mind the extra weight so carried it all the way up here. 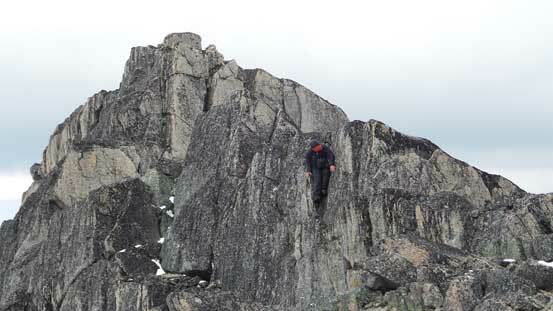 The other side of this col was the North ridge of North Crescent Tower. It didn’t look very hard to us, though a bit jagged and exposed. We checked the book and it’s rated at a ridiculous 5.6. Oh well, we still wanted to try it as it’s not a long way up, and the day continues with an ascent of the North Tower of Crescent Towers. 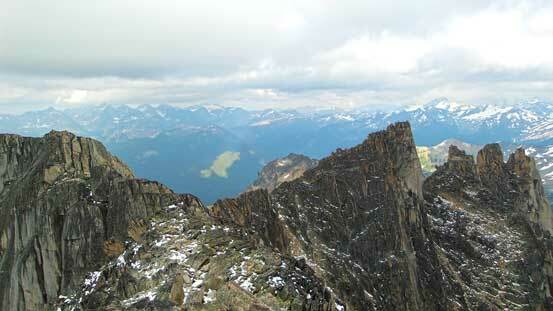 Your Bugaboos reports brought back great memories for me, Eastpost, Crescent, we also did Brenta. Love the Bugs!